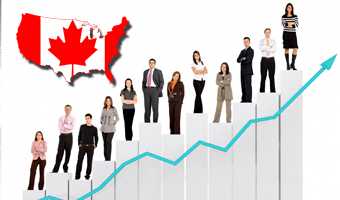 Canada federal Skilled Worker (FSW) Program has been the most popular path to Canadian Permanent Residency (PR). New occupations and caps had been added to three key and popular programs by Canada’s Citizenship and immigration (CIC), which includes FSW, Canadian Experience Class (CEC) and Federal Skilled Trades (FST). The changes are effective 1 May 2014.
Who can apply for Canada FSW program? Minimum of 1 year continuous paid employment for full time or an equivalent amount in part time in a single occupation within the previous ten years. Employed at a skill type 0 or skills levels A or B according to the Canadian NOC (National Occupational classification) edition of 2011. Work experience in any of the eligible occupations or must have an eligible offer for employment or has to be a foreign student who is enrolled in a PhD program (or who has graduated in a PhD program from Canada within the previous 1 year). Applicants who have qualified under the Canada FSW program are chosen as permanent residents depending on their capability to settle in Canada and their contribution to the Canadian economy. Has to have minimum of 1 year experience for full time or an equal amount in part time. Work has to be a paid work. Experience in the same occupation that applicant is interested in applying. Experience has to be within the previous 10 years. Should be in a skill type 0 or skills levels A or B according to the Canadian NOC (National Occupational classification) edition of 2011. The application will be refused if the description mentioned in the NOC does not meet the experience level. The applicant has to meet the minimum language requirement of either French or English through a test conducted by an agency that is authorized by CIC (Citizenship and Immigration Canada). Applicant has to be a diploma holder, certificate, or credential of Canada. An overseas educational credential and an ECA(Educational Credential Assessment) by an agency authorized by CIC to show that it is equivalent to the completed educational credential of Canadian post-secondary or secondary education.